As usual, I’m late to the party. Encyclopedia was published in 2005 and has earned loads of accolades and attention. She’s now deep into another creative project, with yet another twist: The Beckoning of Lovely, a film being made by 200 strangers. Click below to view video. 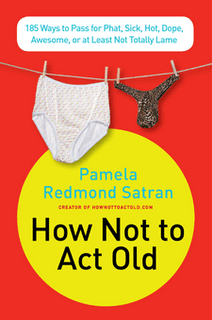 The author is laugh-out-loud funny, offering 185 witty and wry directions. Published just this month, the book zoomed to the New York Times bestseller list in its first week, proving there are a lot of old people desperate for disguise.